Monetize non-spending users – Let’s consider behavioral science concept here. Once users get the taste of a product or service, and if they want more and get used to it – they will go and pay for it too. Same is the case with rewarded video ads as these are the first point introduction to a mobile game’s in-app economy. As per a research conducted by Facebook Audience Research, gamers are 18% more likely to make in app purchases when rewarded video is used vs. non – choice based advertising. Also, gamers who see rewarded videos are more likely to go on and buy the products advertised. Increasing ad effectiveness and user experience – Rewarded video ads are perfect for casual, arcade games as they have many levels and people usually are addicted and want to move to the next level. Rewarded video ads come in between levels to give an option to upgrade in-app arms, weapons etc. Since users get the opportunity to view ads on their own terms, rewarded videos engage them better by hardly disrupting their experience. Higher yield – Brands and advertisers mainly seek high video completion rate, viewability, engagement and undivided user attention. Since rewarded video ads are user-initiated, and in general has a 100% completion rate, the brands & advertisers are keen to pay a premium price for it. Thus, enabling high yield & eCPM for app developers & publishers. Card Game App – One of our card game app client witnessed 10x increase in eCPM with our rewarded video ad formats. The app developer wanted to boost their app revenue by offering high valued in-app content i.e. rewarding in exchange of user-initiated ad, thus maintaining an immaculate user experience. Chocolate helped them by devising an approach where users could be engaged through rewards like unlocking high value VIP rooms, free bonus game chips in exchange of watching a video ad. Sport Entertainment app – A leading sports entertainment app, having over 500K downloads wanted to maximize revenue contribution of non-paying users ensuring high user satisfaction as top priority. Using Chocolate Ad Mediation platform, app developers efficiently improved user satisfaction levels by delivering a viewable/non-obstructive experience through rewarded videos, thus improving app’s fill rates. Gaming app – A mobile app, using technology to match people with tasks, allowing people to watch videos, trying products & services and in turn rewarding the users on successful completion of these micro-tasks and gigs. The developers were looking to monetize the app by integrating ad formats which could improve fill rates standing at 43%. Chocolate helped them by implementing rewarded videos where users watch a video and earn cryptocurrency. The more they watch the more they earn, these earnings can be transferred to personal eWallets. The app developers were able to increase fill rates with rewarded videos and premium demand sources brought to the table by Chocolate Mediation. Check out more Chocolate Ad Mediation success stories here. Rewarded video is becoming the preferred in-app ad unit because this ad format does not diminish user experience like other distracting ad formats. Further, opt-in advertising provides a better brand building for advertisers and more revenue opportunities for publishers. Learn more if you are interested in knowing how you can leverage rewarded video ads in your app monetization strategy. 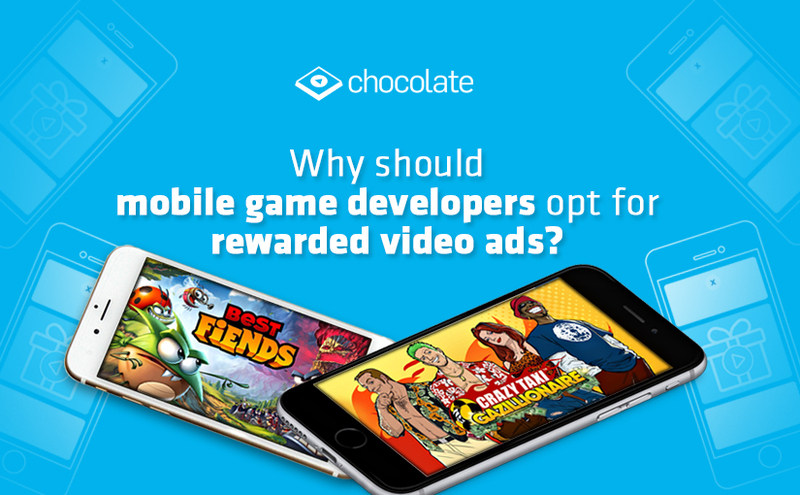 Want to grow your app revenue with Chocolate’s rewarded video ads? Download our SDK now.